The first mission of the Centre National de Rééducation Fonctionnelle et de Réadaptation – Rehazenter is to deliver stationary and ambulatory care to disabled people as well as functional re-education and rehabilitation. 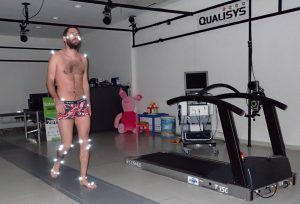 Within the Rehazenter, the Laboratoire d’Analyse du Mouvement et de la Posture (LAMP) is dedicated to the quantitative evaluation of movements, and more particularly walking. Through the analysis of kinematics, kinetics and electromyography, the diagnostic can be refined and treatments evaluated. The strength of the LAMP is based on its multidisciplinary team. It is composed of two doctors in physical medicine and rehabilitation, two physiotherapists and two engineers in biomechanics. This combination of medical, paramedical and biomechanical engineering skills allows the LAMP to explore the complexity of human movement with different and complementary perspectives and thus to carry out relevant explorations and interpretations. Finewire EMG explorations are regularly performed to investigate the activity of deep muscles, or to avoid crosstalk-related noise when a precise measure is needed. One common application is spasticity assessment during a movement. Nerve blocks are also common in our clinical activity. We use them to emulate the effect of potential BTX-A injection or selective motor branch neurotomy. A CGA is then performed before and after nerve block to highlight improvements or degradations in gait pattern. Ultrasound explorations are also used in both these two applications to ensure a high quality and secured exploration achievement. But ultrasound is also synchronised to our motion capture system to define virtual markers based on ultrasound images. The research activity of the lab is relevant to clinical practice, aiming to improve measurements accuracy, to better understand movement disorders and their consequences, and to evaluate treatments or assistive devices. Currently, our research is mainly directed towards the exploration of normal gait but also towards the development and validation of musculoskeletal models. 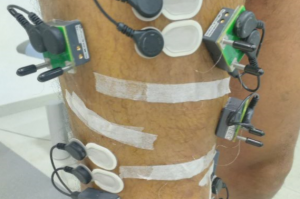 Several clinical research projects have also been initiated to improve the evaluation and treatment of motor impairments in stroke patients, and to analyse the functional impact of new technologies for gait rehabilitation (e.g. implanted functional electrical stimulation) regarding both cerebral and functional aspects.